How to Clean Cast Iron Skillets, Pots, Pans, and More! The kitchen can be a daunting place. Cooking is not easy, and when you have a significant other or young one to provide for, it can be downright stressful. Apart from that, you also have the unenviable task of cleaning up afterwards. The kitchen must be scrubbed down, and pots and pans need to be cleaned. If you let the mess fester for even a couple hours, the mess becomes infinitely harder to clean. In fact, cleaning up after your cooking may be the real troublesome task. If that is the case though, you have come to the right place. In this article, we’ve compiled a simple and comprehensive guide on how to clean some of your everyday kitchenware. This article is meant for the beginner cooker who needs help understanding the tasks required of him or her. Follow this guide and cleaning up after yourself will not have to be a hassle anymore! Don’t Put it in the Dishwasher! Having a dishwasher may seem like a godsend when you clean your kitchenware. But use caution before you toss everything you own in there. In fact, a lot of things in the kitchen are not dishwasher safe and require the attention of hand-washing. In general, your pots and pans should stay away from the dishwasher. Non-stick, cast iron, and aluminum pots and pans should never go into the dishwasher. Non-stick coating will wear out in the dishwasher, cast iron will rust and lose its seasoning, and aluminum will be covered in nicks and scratches. 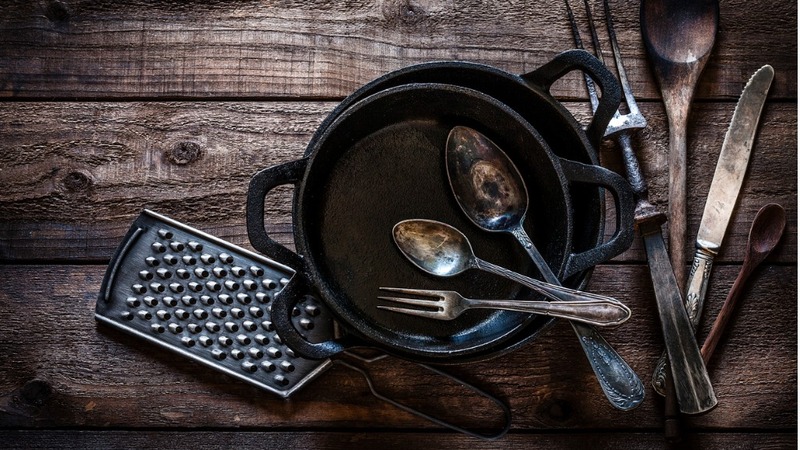 There are lots of dos and don’ts when it comes to cast iron skillets but follow these instructions and your skillet will stay clean, rust-free, and well-seasoned. First of all, soap, steel wool, and the dishwasher are no-no’s when it comes to cleaning cast iron. But don’t worry–if you make a mistake and take off some of the smooth seasoning from the skillet, you can always re-season it after cleaning. For skillets, it is important to attack the cleaning immediately after use. Soaking the pan or leaving it in the sink will let rust appear on the skillet. Instead, jump right in with a sponge or stiff brush and hot water. If there are still pesky stuck-on food bits that you can’t remove, scrub the pan with a paste of kosher salt and water. This should loosen the food residue enough to rinse it off. Dry the skillet with a towel or on the stove using low heat. Finally, apply a thin layer of vegetable oil on the inside of the skillet and buff it off with a cloth or paper towel. Then you’re done! Store it in a dry place. Non-stick pans should avoid the dishwasher too. Instead, when your non-stick pan or anodized aluminum pan needs cleaning, fill it with water and add half a cup of vinegar. Boil the mixture and the residue will float up to the top. Pour out the liquid and wash the pan in soapy water while using a non-abrasive scrub to finish cleaning. After this process, the pan should be good as new! For the sake of the longevity of your aluminum pots, don’t put it in the dishwasher or even let it soak in soapy water. Use a steel-wool soap pad to rub off stuck-on food bits. If the pot already has discoloration on its interior, you can combat it with a quirky concoction. Fill the pan with water and measure out 1 tablespoon of cream of tartar per quart of water (you can use lemon juice as a substitute for cream of tartar). Pour the cream of tartar into the pan and simmer until you have removed all of the discolorations. Whether you want to wash your stainless steel knives or pans, natural cleaning solutions like vinegar, cider, lemon juice, or olive oil should do the trick. While stainless steel can go in the dishwasher without incident, sometimes stains will stay on the pots and knives afterwards. If you want to go for a spotless clean, all you have to do is buff the kitchenware with a cloth dampened by the solution you wish to use. Hand dry the items with a non-abrasive cloth and you’re good to go! If you want to remove burnt food or greasy edges from your glass cookware, all you need to do is follow these simple steps. Pour baking soda on the burnt areas and use a moist cloth to scrub until the burnt areas are removed. If there are still stains, rinse it with water and then spray the surface with ammonia. Scrub it again with a soft cloth, and repeat if necessary until the surface is fully cleaned. Then, wash the cookware one more time normally. Now that you have a comprehensive guide to help you clean your kitchenware after a big day cooking, clean up should no longer look that daunting. You know what works and what doesn’t work when it comes to the different kinds of materials present in your kitchen, so you don’t need to worry about making a mistake and ruining your cast iron skillet or your pots and pans. Cooking is hard enough, so clean up should be easy. Just follow the guide and you’ll have a fine time with your cleaning, so you can focus all your time on providing a tasty meal to your family. Thank you for reading and happy cooking and happy cleaning!